trying to find away to deal with these issues. HOWEVER this is not even the ISSUE! The real issue is not even being discussed! And the REAL ISSUE is only going to get worse as long as it is not addressed. WHAT IS THE MAIN ISSUE? Glad you asked. WHAT IS GOING TO BE DONE ABOUT the GOVERNMENT IN MEXICO? the people a way of life that helps them have a LIFE. Why can't these people get together and do what the people in EGYPT did and DEMAND CHANGE and accountability from their own GOVERNMENT? Texas and the other territories that belonged to Mexico? WHY would our government WAIT until MEXICO has a total COLLAPSE into ANARCHY before doing anything??? COURSE of what is going on in Mexico! financial prosperity? Why don't we help them create a stable government that will produce growth in that country? If God can Heal our LAND, then he can HEAL MEXICO/ We Need a Spiritual Awakening in Both our Lands. The USA is off policing the world, while the nation on our border is the one that needs attention. WHAT EVER HAPPENED to the SPIRIT in the Mexican people who FOUGHT the USA in the days when we where taking their land? They had a REAL FIGHTING SPIRIT for their country. I am really tired of people who want to abandon their own CULTURE, instead of FIGHTING to KEEP IT. country, willing to ABANDON their Country for ours, and no one is even shooting missiles at them? WHAT HAPPENED to the MANIFEST DESTINY IDEA that this nation used to have? 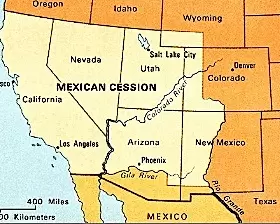 During the presidency of James K Polk, the USA could have just kept on taking territory into Mexico and we could have been a much bigger nation (1849 to 1889). During this time this is what Americans believed (1849 to 1889). on the North American continent. WOW, GOD'S WILL for the USA to take the whole continent! What a Vision. STUDY the LINKS BELOW and learn what Manifest Destiny was about. IS THIS GOD'S PLAN, for us all to be ONE? What would Canada do if we all wanted to MOVE TO CANADA (we did that once)? and save everyone the trouble of moving?? The USA could just offer MEXICO ANNEXATION - THEN MANIFEST DESTINY could CONTINUE. Mexico before we came here and robbed them of their own land. Now they are just moving back. LOVE your NEIGHBORS as yourself is GOD'S WILL. 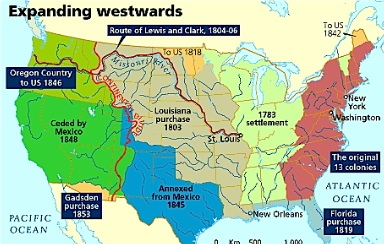 MANIFEST DESTINY was not just a political view on how to EXPAND the territories of the USA, this expansion had a 2 fold concept that seems to be lost in most HISTORY lessons. This was about the preaching of the GOSPEL, or the Great Commission. GO INTO ALL THE WORLD and PREACH THE GOSPEL. This was what the Church thought was their destiny: to EXPAND the USA and make converts of those living in the New Territories. back to us in a totally new way. If the Church will not go into these territories and preach the REAL GOSPEL, then God is bringing them here to us. So this is still about the SPREADING OF THE GOSPEL. That is what it has ALWAYS been about or the USA is OBSOLETE. READ SOME HISTORY on USA AND MEXICO. Find out what the USA did that was unconstitutional, and keeps right on doing. Seems like we took these territories unconstitutionally, and now we are giving back rights that we took, unconstitutionally? Wow we are going in circles! just like we did the Indians? This is the BIG PROBLEM: no one is teaching anyone the REAL USA HISTORY.